by Nur Arafeh, for the Al Shabaka Palestinian Policy Network. If Palestinian Authority (PA) President Mahmoud Abbas is serious about distancing himself from reliance on US mediation and from collaboration with Israel he should look seriously at alternatives to the Paris Economic Protocol – the parameters for the economic relationship between Israel and the Occupied Palestinian Territory (OPT) signed in 1994. Abbas had already asked US President Donald Trump’s Senior Advisor Jared Kushner to amend the protocol in August 2017, when the two sides were still talking. And no wonder: While a main premise of the protocol was that Palestinian-Israeli-regional economic cooperation would bring about Palestinian prosperity, the protocol has instead made Palestinians far more dependent on Israel. It has been the target of popular Palestinian anger, and even some PA officials have called for establishing a new agreement. It’s extremely unlikely that Israel or the current US administration will do anything to change this status quo. The fact that Prime Minister Benjamin Netanyahu’s Likud Party recently approved a draft resolution urging the annexation of large parts of the West Bank demonstrates how far Israel has come in its disregard for Palestinian rights. As such, Palestinians must advocate for themselves and generate a new strategy with regard to the Paris Protocol based on a clear political vision that sets the stage for economic change. In 1994, the Palestine Liberation Organization (PLO) and the government of Israel signed the Paris Protocol, which was attached to the Cairo Agreement and the Oslo II agreement. It established a “contractual agreement” to formalize economic relations, which had previously been unilaterally determined by Israel, in the West Bank and Gaza Strip for an interim period of five years. Despite the expiration of this period 19 years ago, the protocol still constitutes the basis of economic relations between the two sides, and is the main framework for the PA’s economic, monetary, and fiscal conduct. The main goal of the Paris Protocol was to “lay the groundwork for strengthening the economic base of the Palestinian side and for exercising its right of economic decision making in accordance with its own development plan and priorities.” The protocol also aimed to establish “a sound economic base” for relations between the two parties, based on the view that the economic field represents a “cornerstone in their mutual relations.” The protocol contains 11 articles: two relate to its scope, framework, and a joint economic committee, and the nine others address trade, taxation, imports, banking, and labor arrangements, as well as policies relating to the agricultural, industrial, and tourism sectors. Since the 1967 occupation and until the Oslo Accords were signed, the de facto trade arrangement between the Palestinians and the Israelis were akin to that of a customs union. In theory, a customs union is a trade arrangement in which the countries involved allow the free flow of goods among them and agree on a common external tariff with respect to imports from other countries. However, in the “customs union” relationship between Israel and the PA, both use Israel’s trade policy – that is, Israel’s customs rates and other regulations – apart from a few specific goods. 2 In other words, the Paris Protocol formalized a customs union in which Israel’s trade policy is imposed on the West Bank and Gaza Strip. Further, the OPT’s Gross Domestic Product (in current USD) was 13.397 billion in 2016, a fraction of that of Israel – approximately 4.2% in 2016. 3 The fact that the protocol disregards the gap between the two economies is a major problem since the tariff structure required to build a weakened Palestinian economy is very different from the one that suits an industrialized economy like that of Israel. Therefore, even if the customs union had been implemented perfectly, as stipulated in the protocol, it would have adversely impacted the Palestinian economy, as it does not cater to its needs. The inconsistent, one-sided implementation of the customs union by Israel has only made things worse for the Palestinian economy. On paper, the Paris Protocol has allowed movement of agricultural and industrial products between the two sides, and has permitted Palestinians direct trade links with other countries. However, in violation of the Paris Protocol, Israel has imposed restrictions on the movement of goods between Israel and the OPT since the 1990s, such that goods can only move freely from Israel to the OPT, and not vice versa. Israel has also imposed restrictions on the movement of goods within the OPT. Since 1997, Israel has sought to cut off the Gaza Strip from the West Bank, and the ten-year Israeli-imposed blockade on Gaza has further hindered trade relations between the two areas. Israeli closure policies have also disrupted trade relations within the West Bank itself. The ensuing fragmentation of the OPT economy into small and disconnected markets has increased the time and cost needed to transport goods – whether intermediate, final, local, or imported – from one area of the West Bank to another. Moreover, Israeli-imposed closure policies and non-tariff barriers have also severely restricted foreign trade. Examples of such measures include: Israeli non-recognition of Palestinian certification of standards; long periods of testing standards compliance; and the “dual-use items” list – items that Israel claims can be used for military as well as civilian purposes and which are either banned or liable to lengthy security procedures. These Israeli measures are in violation of the protocol, which grants Palestinian exports/imports equal treatment to Israeli exports/imports. As a result, the OPT has become a captive market for exports from Israel. According to a 2016 report from the United Nations Conference on Trade and Development (UNCTAD), Israel recently received 85% of Palestinian exports and “accounted for more than” 70% of Palestinian imports. Meanwhile, the OPT accounts for only 3% of total Israeli trade. Adverse as it is to Palestinian interests, the customs union is unlikely to be replaced by any other trade system as long as Israel’s strategic interests remain the same. Indeed, the choice of a customs union rather than a free trade area, as Palestinians initially requested, was not guided primarily by Israel’s economic interests but rather by political interests in maintaining a “no-state solution.” As Amal Ahmad pointed out, a customs union requires neither the demarcation of borders nor the elimination of borders or integration. This has enabled Israel to postpone the issue of borders altogether by keeping them interim while furthering the containment and colonization of the OPT. Therefore, not only is the Palestinian economy suffering under a skewed system, but the superior power has no intention of changing it as long as it serves its interests. The Paris Protocol formalized a clearance revenue system whereby Israel collects customs duties on imports from abroad that are destined for the Palestinian market but are required to go through Israel first. It also collects indirect taxes (value-added taxes [VAT] and others) on Israeli products sold to the Palestinian market and income taxes and social transfers from Palestinians employed in Israel or in the Israeli settlements. Israel is supposed to transfer these revenues, also known as clearance revenues, to the PA on a monthly basis, after collecting a fee of 3%. While the clearance revenue system has granted the PA access to significant resources, because nearly all direct and indirect taxes paid by Palestinians in the OPT had been kept by Israel before signing the protocol, it has at the same time given Israel immense power over Palestinian revenue. For example, in the 2017 PA budget, clearance revenues represented 66% of the PA’s net revenues, meaning that Israel dominates about two thirds of the PA’s revenues. The Paris Protocol has in effect deprived the PA of its sovereignty over its fiscal revenues and thus over its very survival. Israel exploits this control by withholding Palestinian tax revenues as a punitive measure or to exert political pressure on Palestinians (see examples in Table 1). Another consequence of the Paris Protocol’s arrangements is fiscal leakage, or the withholding of fiscal revenue destined for the PA but kept by Israel. For instance, Israel only considers as imports those goods that are directlyimported to the OPT via Israeli ports. Indirect imports (foreign goods that are first imported to Israel and then re-exported to the OPT) are not counted as imports, although their final destination is the same. As a result, import charges paid on these goods are collected by Israel without being transferred to the PA.
Further, purchase taxes and excises on Israeli-produced goods that are exported to the OPT are not transferred to the PA, except in the case of petroleum products, cigarettes, and alcoholic beverages. Finally, the transfer of VAT and other taxes from Palestinians’ direct purchases from the Israeli market is conditional on a clearance bill that proves the sale or purchase of goods between the two markets. Israel holds all revenues from these taxes in case of non-submission of clearance bills. 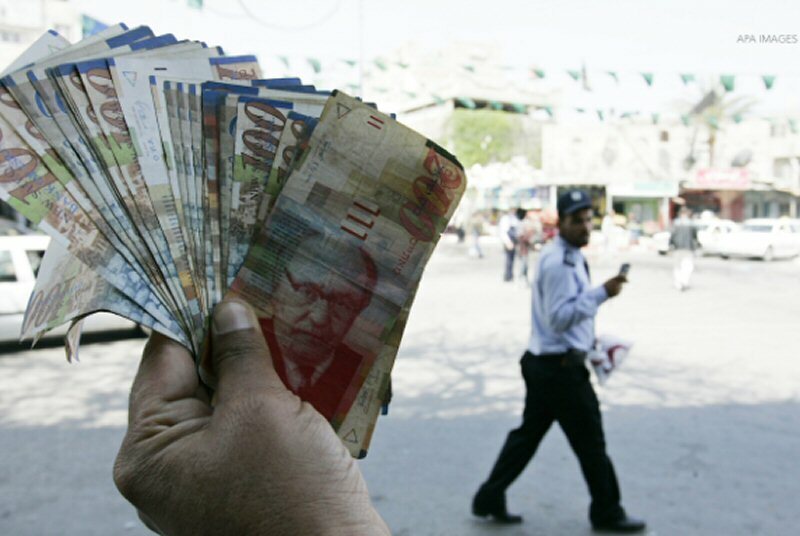 The considerable drain of revenue has had severe repercussions on the Palestinian economy. A 2014 UNCTAD study confirmed over $310 million worth of leakage in 2011 as a result of importing from or through the Israeli market. The estimated cost of the leaked amount is equivalent to 17% of total tax revenue, and accounts for 4% in lost GDP and around 10,000 jobs a year. Furthermore, it should be noted that the choice of a clearance revenue system in which Israel chooses to collect fiscal revenues and then transfer them to the PA is in line with Israel’s efforts to maintain a “no-state solution” in the OPT, just like its choice of a customs union, as described above. The clearance revenue system neither allows Palestinians to have control over their own borders and thus separate from Israel, nor does it allow their integration into the Israeli economy. Hence, a no-state solution. What could replace such an imbalanced trade system that bleeds the Palestinian economy and keeps Palestinians tethered to Israel’s exploitative interests? Two main paths are often put forth. The first is an improved customs union relationship with Israel. However, the trade regime as prescribed by the Paris Protocol has proved to be deleterious to Palestinian political and economic interests, since the problem is the structure of the protocol itself, not just Israel’s violations of its terms. This has led an increasing number of researchers to conclude that amendments to the Paris Protocol would be futile and that Palestinians should break free of it. Therefore, an alternative path for Palestinians is to advance a new trade regime. Such a trade regime could involve two arrangements, either a free trade area (FTA) or a non-discriminatory trade policy (NDTP). A free trade area allows for free trade between member countries. However, contrary to a customs union, each country has its own trade policy with respect to third-party countries, thus making economic borders a necessity. The establishment of an FTA, and thus of customs borders, would put an end to fiscal leakage and would allow the PA to design its own import policy that suits its development needs. In past negotiations, the PA showed a strong preference for this as it could allow for greater political independence. In a non-discriminatory trade policy the PA would adopt its own trade policy unilaterally without offering or receiving preferential access to or from Israel. Therefore, unlike the customs union and the FTA, which facilitate the import of goods from preferential trading partners, under an NDTP the PA would set the same tariff on imports from all countries and thus ensure a more level playing field. Needless to say, the ability of the PA to adopt its own trade policy requires control over its borders. In another option, a recent 2017 Palestine Economic Policy Research Institute (MAS) study proposed a new Palestinian tariff structure in line with Palestinian development interests, either through a continuation of the status quo while exploiting the Paris Protocol or via an independent non-discriminatory Palestinian trade policy that would be based on promoting industrialization. Such a separate trade regime, which would require Palestinian sovereignty and the establishment of well-defined hard borders between the Palestinians and the Israelis, is widely considered necessary in a future independent Palestinian state and economy, especially as it would allow for an autonomous Palestinian tariff regime on all imports that would reflect Palestinian economic and development needs. In addition, further research is needed to explore how the agricultural and industrial sectors can be promoted as part of the struggle against Israeli land expropriation and can build a productive economy that reduces dependency on Israel. And since the boycott of Israeli goods can increase the cost of the occupation while protecting Palestinian products, efforts should focus on encouraging and subsidizing local production and ensuring the high quality of local products. However, for any such options to be fulfilled a clear-cut Palestinian economic vision and strategy that is guided by a political vision and interest must be developed. Indeed, the main question that needs to be answered for this economic vision and strategy is within which political framework it is to be advanced and what the frontiers of the “Palestinian economy” are. In the pre-Oslo economic and development literature, the dominant understanding of economic development was geographically limited to the 1967 borders, and the economy was intrinsically linked to the political frontiers and the creation of a nation state. Hence, most researchers focused on the “economic viability” of a future Palestinian state. However, in some of the post-Oslo academic literature (as opposed to that of international organizations) the Palestinian struggle is being re-conceptualized as an anti-colonial, rights-based struggle rather than a nation-state project. Many scholars are calling for transcending the limited focus on the West Bank and the Gaza Strip in order to reintegrate all human resources from the Palestinian body politic, including Palestinian citizens of Israel and Palestinians in the diaspora. How this reconceptualization of the Palestinian struggle would affect the understanding of “the Palestinian economy” and Palestinians’ future economic vision is a question that has yet to be answered. Part of the analysis in this policy brief is based on work done by the author when she was a researcher at the Palestine Economic Policy Research Institute (MAS). The Paris Protocol allows the PA its own import and customs policy with regard to limited quantities of specified commodities, such as small tools. Calculated by the author drawing on the World Bank database. Al-Shabaka Analyst Nur Arafeh served as Al-Shabaka’s Palestine Policy Fellow from 2015 – 2017. Nur is currently a Rhodes Scholar, doing her PhD in Economic Development at the University of Oxford. She previously worked as an Associate Researcher at the Palestine Economic Policy Research Institute (MAS), and as a Visiting Lecturer of Economics at Al-Quds Bard College. She has a dual BA degree in Political Science and Economics from the Paris Institute of Political Studies-Sciences Po and Columbia University, and holds an MPhil degree in Development Studies from the University of Cambridge.